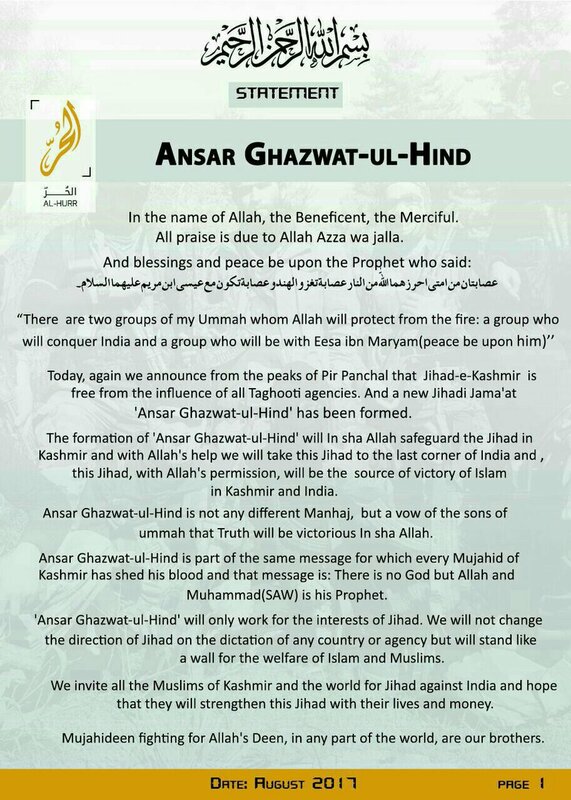 Ansar Ghazwat-ul-Hind, an al Qaeda linked terror outfit operating in the Kashmir region, released an audio message last week featuring its chief and former Hizbul Mujahideen commander, Zakir Musa. 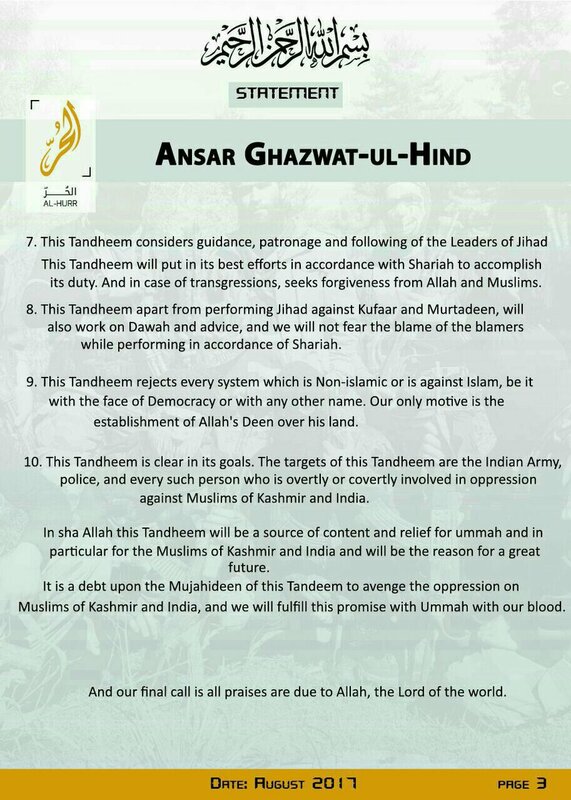 Musa uses the message to paint a picture for the future of Ansar Ghazwat-ul-Hind’s jihad in the Kashmir–a jihad without ties to Pakistani guidance, with fighters sourced from throughout the region, and focused on the implementation of Sharia, or Islamic law, in Kashmir through terror. He also eulogizes the death of Ansar Ghazwat-ul-Hind’s deputy commander Rehan Khan. The group’s Al-Hurr Media disseminated the audio message, which featured approximately fifteen minutes of Musa speaking over intermittent B-roll imagery and related videos. This is the first message from Ansar Ghazwat-ul-Hind since September of 2017, when they released a similar production also featuring remarks from Musa. While Ansar Ghazwat-ul-Hind has not publicly sworn allegiance to al Qaeda or any of its leaders, evidence suggests that the outfit is closely tied to al Qaeda’s operations in South Asia. 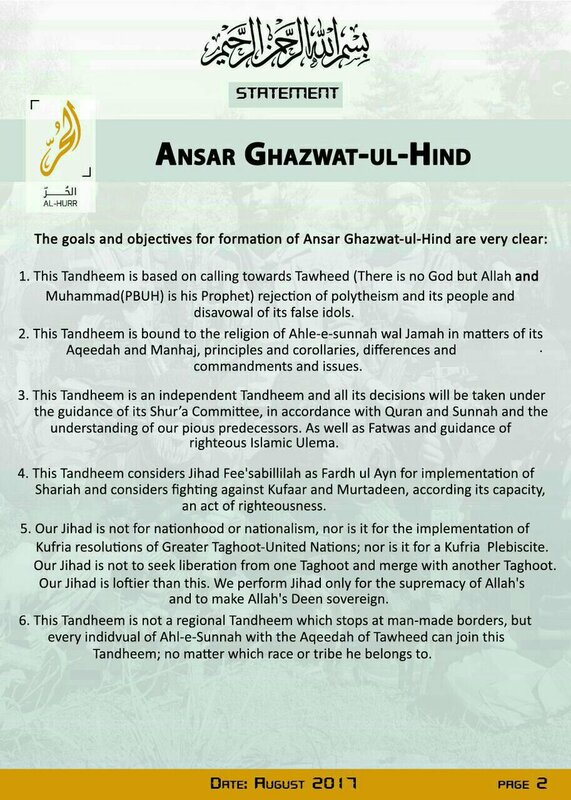 As FDD’s Long War Journal editor Thomas Joscelyn has pointed out before, “Ansar Ghazwat-ul-Hind released a three–page statement on Aug. 20th, 2017 emphasizing that it is ‘free from the influence of all’ intelligence agencies. The message was entirely consistent with the argument advanced by AQIS [Al Qaeda in the Indian Subcontinent] in its code of conduct,” which AQIS put out just two months prior. Ansar Ghazwat-ul-Hind could very well be a part of al Qaeda’s consistent “image-laundering” efforts. Al Qaeda affiliates often rebrand, rename, or branch off into new groups entirely on a frequent enough basis to give those tracking their activities second pause. Ansar Ghazwat-ul-Hind is not currently listed as a foreign terrorist organization by the US State Department. According to local Kashmiri news outlets, Musa notes in his audio recording that “Many people from both India and Pakistan have joined [Ansar Ghazwat-ul-Hind]. We are stronger than ever. Our numbers have gone up. We will restart our operations soon.” These claims can not, of course, be verified. In fact, Zakir Musa and his Ansar Ghazwat-ul-Hind have been largely dormant for the last year. Not only have they not released messages or statements, their “jihad” doesn’t seem to be all that active in the region in ways of recruiting or attacks. The group has been responsible for few, if any, documented encounters with Indian or Pakistani forces in Kashmir. Traditional groups like Jaish-e-Mohammed continue to make the most waves in the region’s ongoing struggle. Most recently exemplified by the bombing in Pulwama that killed dozens of Indian CRPF personnel. The emphasis on “traitors who backstabbed the Jihad” is an allusion to Musa’s clear disdain for the Pakistani intelligence agencies and those groups that are beholden to Pakistani support and guidance–groups like Lashkar-e-Taiba, Hizbul Mujahideen and Jaish-e-Mohammed in the Kashmir. *According to an exclusive translation of the recording obtained by FDD’s Long War Journal, Zakir Musa makes it clear he thinks Pakistan is holding the Kashmiri jihad hostage: “[The] Pakistani government and army are our primary enemies against jihad. They betray us mujahideen by pushing us to jihad and then claiming their control over us. The reality is that the Pakistani military is a slave of the Americans. But, they sometimes take the cover of mujahideen and fool the Kashmir jihadis. Beware! It is only Allah that gives us victory.” Musa also claims that “we are in the knowledge that many [Kashmir focused] movements are facing a crackdown from Pakistan and India.” He does not detail what the “crackdowns” entail. Musa’s example of the Afghan Taliban as a jihadist group that is independent of Pakistani influence is curious. It is well documented that the Taliban receives significant support from the Pakistani state, and Musa is surely aware of this historical sponsorship. This inconsistency could suggest an underlying bitterness from Musa that Pakistan does not give Kashmiri jihadists the same latitude to fight India that is given to the Taliban in Afghanistan. This type of condemnation of Pakistan is nothing new for Musa. He also called the Pakistani government “slaves to America” who have “betrayed” muslims in the Kashmir in his 2017 audio recording released by the same Al-Hurr Media arm. It’s yet to be seen whether Zakir Musa’s strain of jihad will resonate in the Kashmiri region as a viable alternative to the mainstay terror groups currently propped up by a Pakistan with continued interests in the unrest there. *Credit: Exclusive translation prepared for FDD’s Long War Journal by Taha Siddiqui. Phil Hegseth is a contributor to FDD’s Long War Journal. Are you a dedicated reader of FDD’s Long War Journal? Has our research benefitted you or your team over the years? Support our independent reporting and analysis today by considering a one-time or monthly donation. Thanks for reading! You can make a tax-deductible donation here.